If you look back a few years at the first post on the Cackle you will see that it involves Flan. We had a small competition to see who made the best flan although at the time one of the "competitors" didn't bring in the flan until a few weeks after the actual competition date. 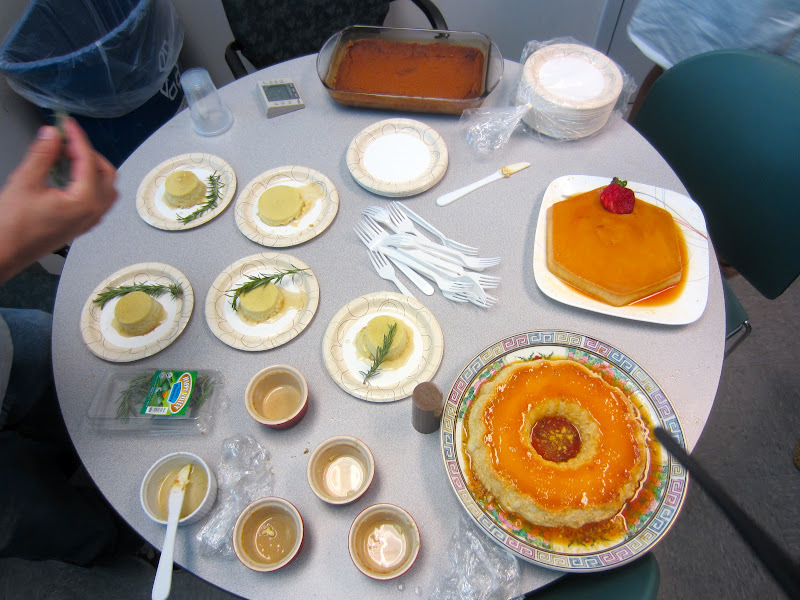 In any event, the whole notion of who makes the best flan and there should be a competition came around again. Clearly there is some kind of obsession about flan! When I mention flan I refer to the egg, milk and sugar creation - a sweet custard which is baked in a mold in the oven until set, when it may be served in the mold or turned out onto a plate for presentation. Some people refer to fruit tarts as fruit flans and in Britain flans are not necessarily sweet. That is not what we are referring to here. 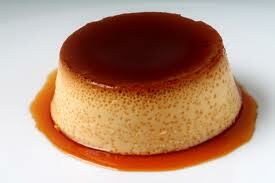 Flan is apparently a standard type of dessert in Spain and Portugal and made the move to the New World colonial lands. So one can expect to see flan in various incarnations in Cuba, Puerto Rico, Colombia etc. In fact people with heritages from these particular countries each were eager to participate in the flan off to put their best flan forward. It was up to the rest of us to judge which was the best! There was indeed some ugly chauvinism as to which country claims the best flan but we will not go there. We had five mostly willing but somewhat coerced competitors. We ended up with five different looking flans. 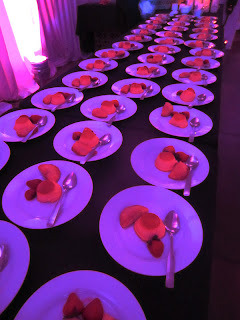 Our first offering was actually a series of mini-flans. It's unclear where the recipe came from but we know that he used real ground vanilla bean for the flavor and perhaps some herb. The flavor was a bit more delicate and did not taste like the traditional custard. It was also not so sweet despite the sugar syrup that did not caramelize that went with it. The mini-flans were presented on the plate with a sprig of fresh rosemary which everyone agreed was a very creative touch. The second flan also looked great. It was a large ring displayed on a decorative plate and was drenched with the caramelized sugar sauce that flans are known for. It was a good size which helped it to make an impressive entry. The taste was what one expected however the consistency of this one was a bit coarser making it more custard like. To those who could have cared less it made not difference but the flan purists considered that a bit of a problem. Well complemented by the plate! Flan number 3 was also visually very well received. This was laid out nicely on a plate with a sliced strawberry as decor and a bit of whipped cream. Extra whipped cream was offered to go with a slice. This looked very authentic with the surface having the brown caramel color with also an adequate amount of the syrup. The taste was very good and not to heavy. The consistency was very smooth and we were told this was because the batter is whipped before it goes into the pan and then into the oven. Our fourth entry was formed in a copper mold. This one was made with duck eggs and pomegranate was added for a different but nice touch. Coming out of the mold something happened and the caramel syrup sort of stayed behind. This supposedly affected the presentation but contrary to the chef who made it it was not deliberately sabotaged by a competitor. The duck eggs gave it a stronger egg taste which was fine but the fruitiness of the pomegranate offset that nicely. It wasn't that sweet tasting but this could have been due to the syrup not making it out onto the plate. Comeptitor Four with Flan in a jello mold! The last entry had a unique look. This is because our cook used Dulce de Leche (caramelized milk) instead of the regular milk to prepare the batter. This gave it a dark color and a stronger taste for sure. There was not a lot of the syrup which was fine because the taste of the caramel in the flan itself more than compensated. Table full of flans - let the tasting begin! Everyone who came was initially given a plate with a taste of each of the flans. After that they could co back and help themselves to extra samples. They were also given a ballot and asked to score each of them in two categories presentation and taste. In each category evaluators could award up to three points and at the end the ballots were collected and the flan that had the most points in each category was deemed to have won that category. And the results are.....for presentation there was a tie between our mini-flans - competitor 1 - with the rosemary and the traditional flan - competitor number 3 - with the strawberry garnish. And the big award for the taste went to flan number 3 - again the one with the strawberry garnish and the available whipped cream. Apparently whipping up the batter is a winning strategy. Flan makers take notice!! It also appears that our flan tasters were definitely inclined to the traditional! It was someone's birthday today! At an earlier class or academic session they presented her with a birthday cake. We weren't there but there was enough of the cake leftover to bring it to cake hour. It was a standard commercial product with the cake being marble and the frosting the usually over-sweetened type made from sugar and lard or sugar and vegetable oil. (What are we thinking?) It was still good and moist, we definitely enjoyed it and were very appreciative that our birthday girl thought of us. It's still a good size chunk of cake, hmmm? The remnants of the writing! Haven't had a marble cake in a while! Do you notice something about those flowers on top of the cake, however. Most of us have used food coloring before but seriously how on earth did they get these fluorescent colors. That is some serious pink and orange coloring to be consumed. Fiesta ware used to use uranium to get such an orange color! Actually as you can see some felt that it was more appropriate as a milieu for another round of cake art! We are talking serious food coloring. Is that orange uranium based? If you can't eat it, play with it! And we have our winners....finally! The last contribution to student cake month competition finally came today. This was supposed to all be finished for the month of July but stretched into August due to vacations and just coordinating this particular flock of summer students. Truth be told we weren't shy in making sure we got something from everybody. It just so happens it took awhile to get the final "volunteer" contestant to bring in the goods. Gosh, do you think it's a carrot cake? We had been fairly lucky in that most of the students this year did make their entries. We got to have some good and somewhat very interesting homemade stuff. Chamomile, Key Lime, Peanut Butter - just a few examples of the good things that were featured. The final entrant, however, went for a commercial product...a carrot cake. We've definitely seen the offering before and believe it came from either Whole Foods or the East Side Marketplace in Providence. We thought we were going to get one from Gregg's - a great place to buy cakes - but it does not look like theirs. Frosting carrots on the top! Some really serious walnuts embedded in the frosted side! It's a small cake so two layers will suffice! It was as good as expected. It had the obligatory cream cheese frosting, the inevitable carrot frosting decorations, a great moist classic cake in two layers with filling in between and for an added touch crushed walnuts all over the sides. For those of us nut lovers this was an added treat. The crushed nuts were so abundant that it would have been fatal for anyone with a nut allergy to have been around. (Disclaimer: Cake hour is not a "Nut Free Zone".) This cake was a little smaller than some carrot cakes we have had but there was plenty to go around and a four layer cake is not always necessary. This was awarded three stars for the competition. Our student donor was not around so we could not offer his photo with his contribution. And we have the winners!! With this final evaluation we could now declare the winner(s) of student cake month competition and they would be the chocolate cake with the almond brittle and black sea salt for one. The other the BCA cake...the one inspired by our protein measuring assay with the purple cake layers and the passion fruit syrup. For prizes they received anti-fail T-Shirts which had nothing to do with cake hour but seemed appropriate to give someone who won a competition and for added fun a Tokyo Dineyland multi-colored pen. Congrats to our two winners and may they win cake competitions for years to come.